Below I have compiled my returns (in interactive graphs and tables) to show you how my investments are performing. This overview also shows you how much you can earn through each of these P2P investment platforms. Look at it as if i am the test guinea pig. Maybe the returns that I have achieved differ to what you would expect for the platform? 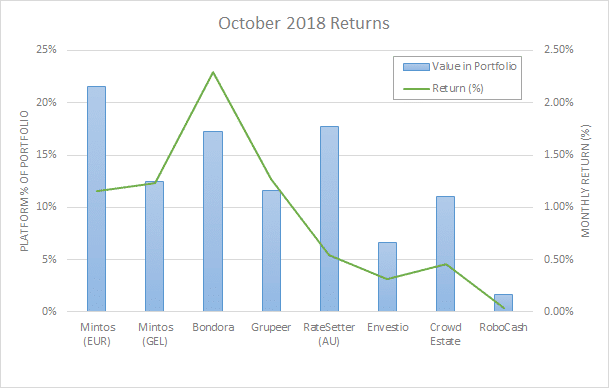 This graph above provides the stacked returns that I have made (per month) through each of the P2P investment platforms that I invest in (Mintos, Bondora, Grupeer, Rate Setter (AU), Envestio, Crowd Estate, Fast Invest, Crowdestor and Reinvest24). Each month is marked in a separate colour, and the total investment can be seen on the bottom axis. The average investment return has also been included. Click on the graph to see more details. 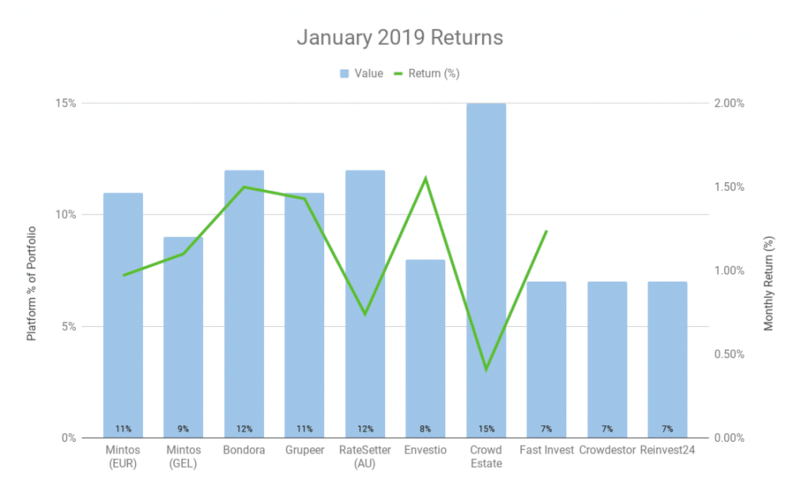 The above chart shows you the diversification that I have between the different P2P Investment and crowdfunding platforms. It can be easily seen here if I am over-exposed in one platform compared to another. This graph above similar to the above, but shows the data in a different way. 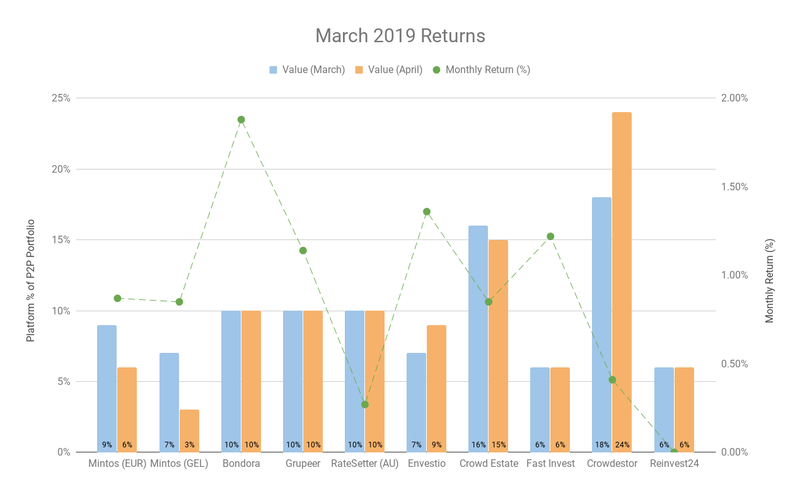 This graph makes it clear how each investment is performing each month. From this graph, I can plot averages and make trend lines to estimate future returns. This graph shows how my average P2P returns have compared to the S&P 500. As you can see from the graph, in 5 months my P2P returns out earned the S&P 500 by over 11%. 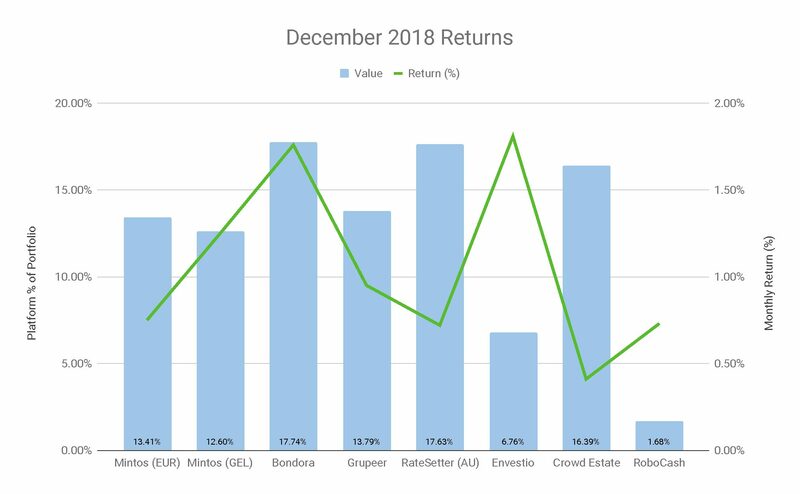 I have also included the average returns of my share portfolio here as well. The P2P returns are shown on the solid line, and the returns from both the S&P 500 and my share portfolio are in the broken line. 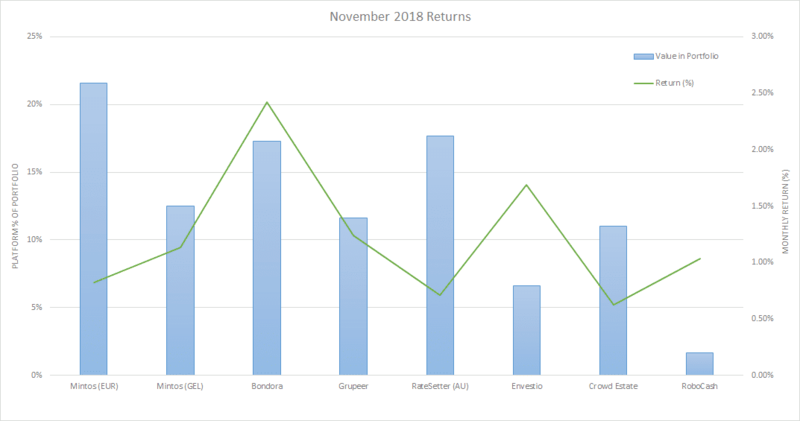 Month is on the bottom axis and % return is on the side. Click on the graph to see more details. Performance tracking over time – where you sit compared to your financial goals, how you compare to others, and expectations of investments. Monitoring of outflows – outflows include fees or payments that may occur. Generally P2P platforms have no fees, however, there can be fees for currency conversions, and purchasing second hand P2P loans. Continual adjustments – It is important to diversify investments taking into account investment types, platforms and countries. By creating financial overviews, you can see if you are to exposed in a certain area. I have also provided the data in a table format. The table can be set in ascending or descending order to easily see each months investment. return since my P2P portfolio commenced. See what I invest in. 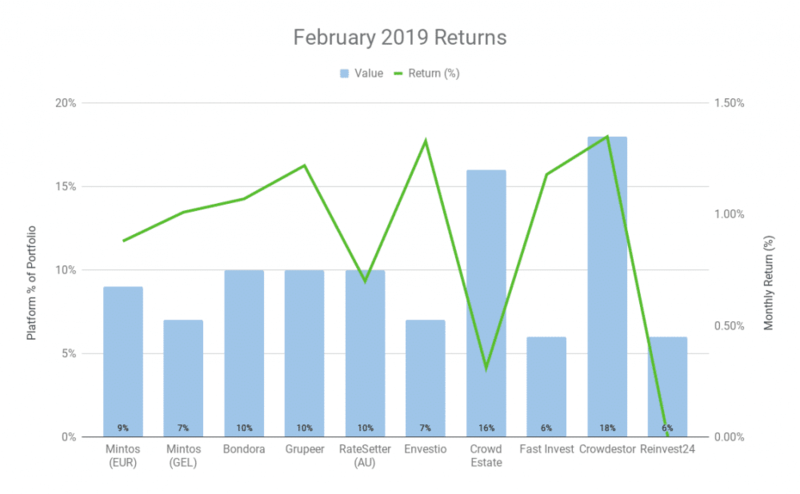 Kuetzal (6-21%) – Register with Kuetzal and enter SPRING2019 in the registration form to receive a € 10 sign up bonus and a bonus 0.5% on all investments for 180 days. Mintos (11.7%) – Register with Mintos for a 1% cashback within the first 90 days of registration. Bondora (9-17%) – Register with Bondora and receive a € 5 sign up bonus. Envestio (up to 22%) – Register with Envestio and receive a € 5 sign up bonus (after €100 deposit), and a bonus 0.5% of your investment. Fast Invest (9-16%) – Register with Fast Invest and earn € 10 when you invest €200 for 90 days or more. None of the article on my website have been paid to be written. They are all from my experiences using the products. This post may contain affiliate links and such links may reward me a small commission (at no extra cost for you). Please note: Investments have risks. Before investing in anything do your own due diligence and research. Nothing in these articles is financial advice. Just one man trying to share his working and investing experiences! The Working At Home Man © 2019. Privacy. Enter your email below to stay updated with our most recent content!